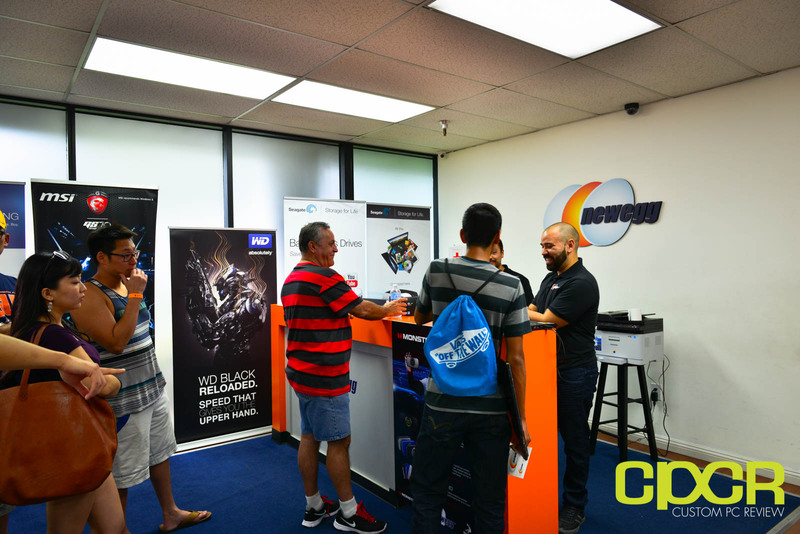 Several days ago, I was fortunate enough to be invited to Newegg’s Monster Madness event hosted at their Hybrid Center in City of Industry, CA. Since I’ve never had the opportunity to check out Newegg’s Hybrid Center, I thought it’d be pretty cool to swing by the event and take a quick tour of this Hybrid Center that I’ve heard heard so much about. 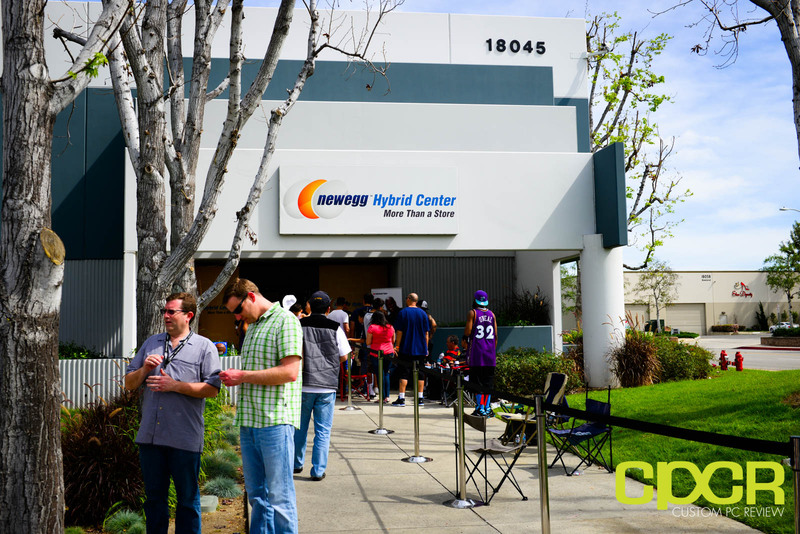 Since my trip to the Newegg Hybrid Center happened to be on the same day as Newegg’s Monster Madness event, there was actually a pretty big line to get into the center. Former basketball star Shaquille O’Neal was supposed to make an appearance later on in the day and I believe purchasing some Monster gear gives you the potential of pictures and autographs with Shaq. 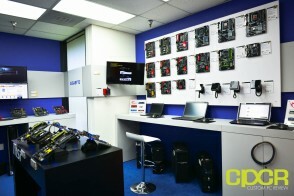 Once inside the Hybrid Center, there was yet another line to the pickup desk where customers picked up their new Monster products. 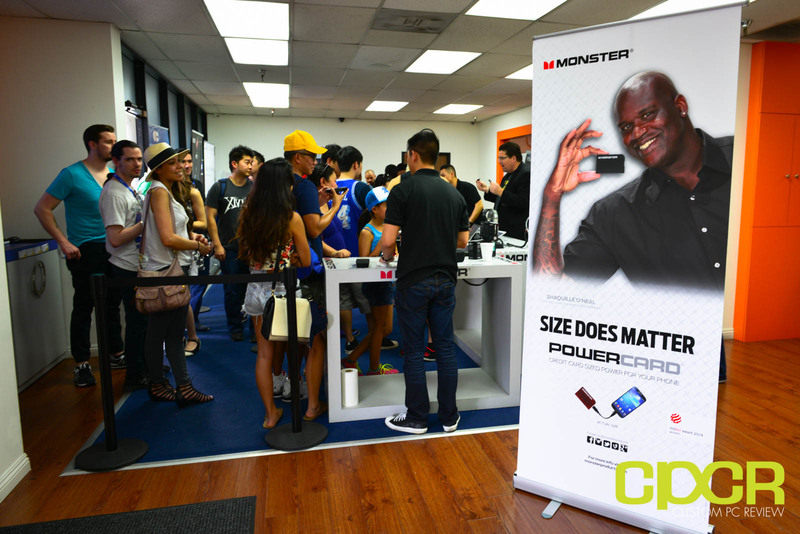 For the day, Newegg and Monster was promoting the Monster Superstar Backfloat speakers, Superstar speakers, and the Powercard portable battery pack which is what most customers walked away with. 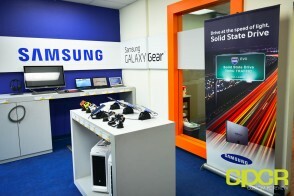 Normally, this counter is where Newegg customers can pick up their Newegg orders. I was assured that the line to pickup is never usually this long and customers are usually in and out with their orders pretty quick. Customers can also physically see and try out some of the latest and greatest products at the Hybrid Center as well. Newegg had quite a bit of hardware on display including smartphones, tablets, wearables, computer hardware, laptops, etc. 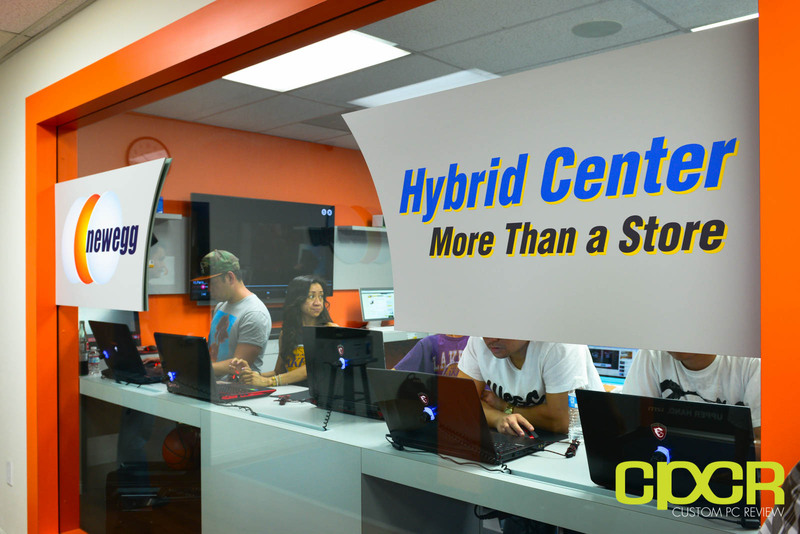 Unfortunately, it’s not possible to directly purchase products from the Hybrid Center although all the products on display can be purchased through Newegg and picked up at the Hybrid Center. 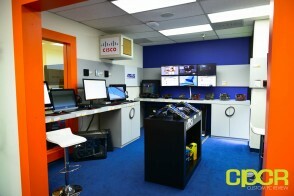 Personally I think a Hybrid Center type place is a cool concept and Newegg could really capitalize on it by putting it somewhere where you’d get more foot traffic such as a mall or shopping center. Currently it’s in an industrial/warehouse type of area and aside from special events, I doubt it’s somewhere that most people put on their weekend lists as places to go. If Newegg can provide things like free shipping for orders from the center, one hour pickup, return services, etc. 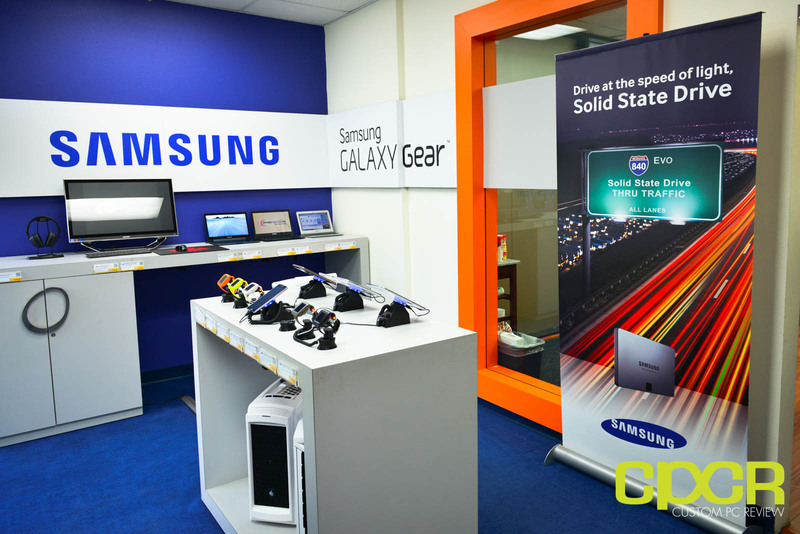 at the center it would make a lot of sense for customers to make purchases at the center especially since Newegg’s pricing and selection can be very competitive compared to most brick and mortar retailers. After spending some time playing with some new products inside the Hybrid Center, I went back outside to check out some of the various games, activities and food that were there for the Monster Madness event. There was a Shaq Fu tournament going on where the winner of the tournament would get to go head to head with Shaq. The game was before my time, which might explain why I got destroyed on the second round. I also got to shoot some hoops for raffle tickets which gives players the chance of winning of cool new Monster products every so often. Overall it was a fun experience and these events are supposed to be held every so often, so if you live in Southern California, be sure to like/follow their Facebook/Twitter for more information on upcoming events!